Cask ale - for what it's worth. Cask ale has been at the heart of what we’ve done since we first opened our doors in 2014. We’ve always attempted to showcase the best that cask has to offer, supporting both well established brewers making traditional styles and young breweries producing modern styles. To present this uniquely British product at its best takes time, care and no small amount of patience. There has been a great deal of conversation recently within the beer community about the price of a pint of cask ale; some feel that it is overpriced while others feel that it is undervalued. We have always attempted to offer good value to our customers; our cask ale price has only risen by 50 pence over the last four years and we have always sold our beer at the same price across the board. When combined with our loyalty card our beer prices are very reasonable. Recently we have noticed an increase in pricing from many of our favourite breweries. These are breweries whose beer and ethos we love and who are presenting innovative, flavourful and often boundary pushing beer in cask. We feel that these breweries should continue to be championed in pubs like ours. Our loyalty card scheme is still in place and will continue, so every 10th pint is on us. We feel that this pricing structure still offers good value to our customers and we hope that you can understand our reasoning for the changes. Over 40 casks, over 30 kegs, 15+ ciders on tap! Friday 29th - Sunday 30th with Live Music, Home Smoked BBQ and Sunday roasts to top it all off. 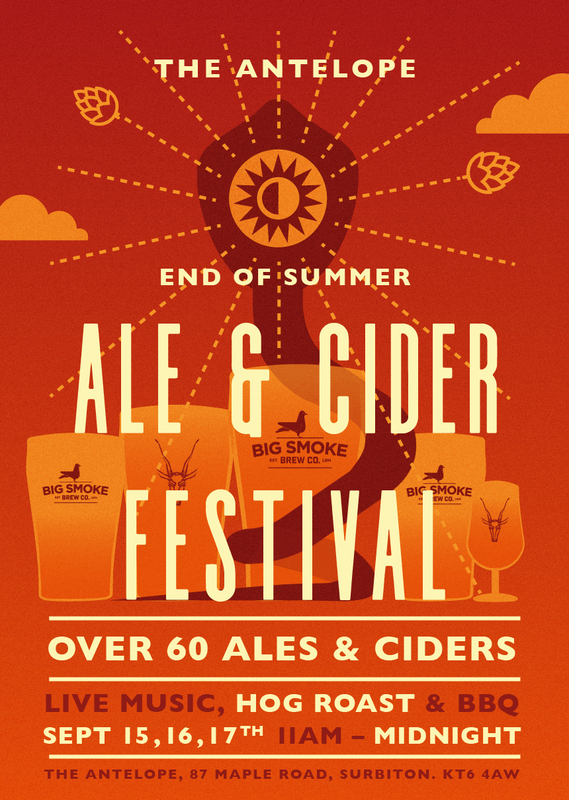 Take a look at our Bank Holiday weekend Ale & Cider Festival cask and keg choices, along with exclusive and limited edition brews from Big Smoke! See you at the bar! Over 40 Casks, 30 Kegs and 20 Ciders as well as Hog Roast, BBQ and Full Menu, plus Live Music throughout the weekend and Sunday Roasts to round things off! Join us for another fun-filled New Year's celebration at The Antelope. Once again we have the legendary Alix Anthony playing with a full live band. Alix is well known for his incredible showmanship, amazing guitar skills and awesome selection of songs; from James Brown to Prince to Bill Withers and everything in between. If you like if funky, Alix is your man. We'll also have an extra bar in the brewery serving up bottles of prosecco and big smoke beers on draught. Food will be in the form of a hog roast and bbq in the garden. There are no tickets and it's free entry for all, so come on down, grab a table early and prepare for fun times! So here it is! The list for this weekend's Beer Festival. Plenty for everyone! See you here. 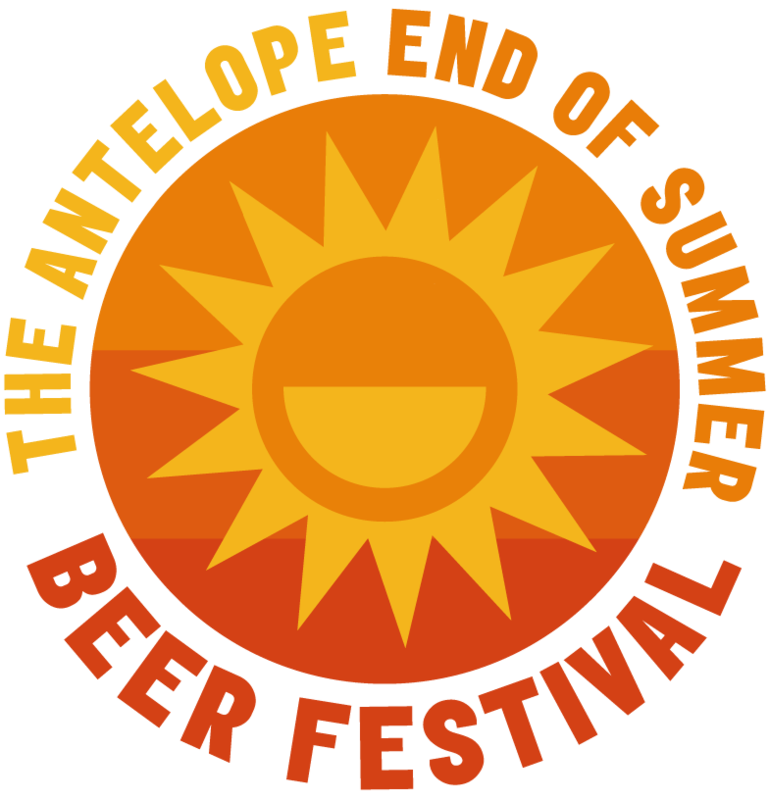 The Antelope Ale and Cider Festival! It's that time of year again folks! Join us for our biannual celebration of all things beer and cider. We'll have over 60 ales and ciders available over the weekend from the most progressive, independent breweries in the UK. We'll also have a couple of exclusive one-offs from our on site brewery, Big Smoke Brew Co.
Food-wise we'll once again be firing up the hog roast and BBQ with a delicious range of meat and veggie options. Top this all off with live music each night and you've got a recipe for a very good time indeed. Free entry and no tickets. Join us to ring in the New Year! We have the excellent Wessex Pistols playing live, hog roast in the garden and plenty of great beer on tap. We are expecting to be very busy so get down early to grab a table. We're having ourselves a little Halloween Knees Up on Friday the 30th. Live music from The Fangbangers who'll be playing all the spooky hits from 9pm. Beer list for our upcoming Ale & Cider Festival announced. 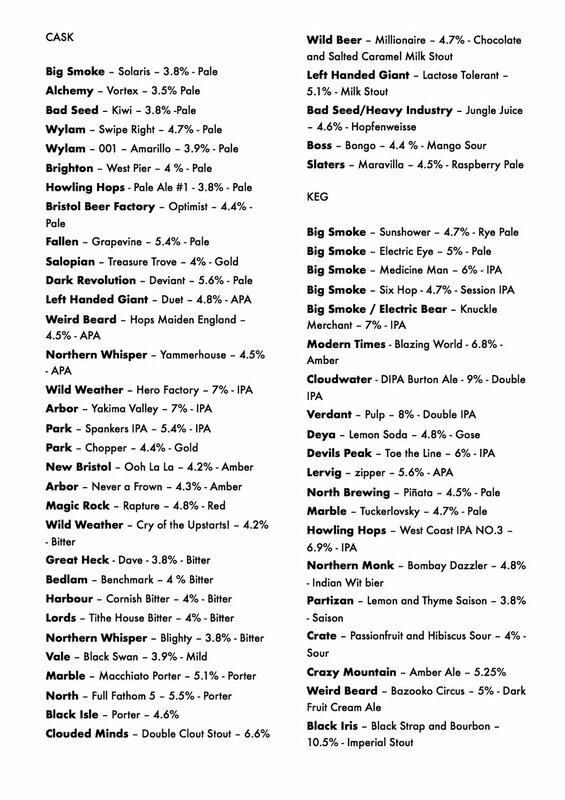 After much discussion and planning we're happy to share the (almost) complete beer list for our upcoming beer festival. We've attempted to strike a balance between light and dark, low ABV and high ABV, weird and sessionable but are pretty happy with the overall list. We're very lucky to have beer from Rocky Head and London Beer Lab as neither have put their delicious beer into casks before. We also have the cask launch of Big Smoke Brew Co's brand new Medicine Man IPA which weighs in at a hefty 6%. There are a few final additions to be made to this list and there may be one or two changes. The full list including descriptions and tasting notes will be available in our programme which will be available at the festival.